Zorro ransomware uses sophisticated techniques to infiltrate computers and hide from its victims. Use Reimage to determine whether your system is infected and prevent the loss of your files. How dangerous is Zorro ransomware virus? How might this file-encrypting virus hack computers? How to terminate Zorro ransomware from the PC? Zorro virus is a new file-encrypting malware that uses symmetric cryptography to encode files located on the targeted computer. The ransomware mostly spreads via malicious email attachments. When a user clicks one the infected file, the virus infiltrates the computer. 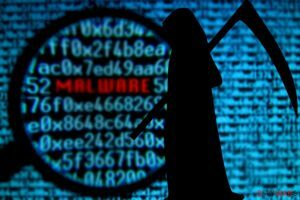 Once the malware gets inside, it connects to the remote Command & Control server and downloads malicious files. When Zorro ransomware installs all malevolent files in various Windows locations, it modifies Run and RunOnce registry sub-keys. 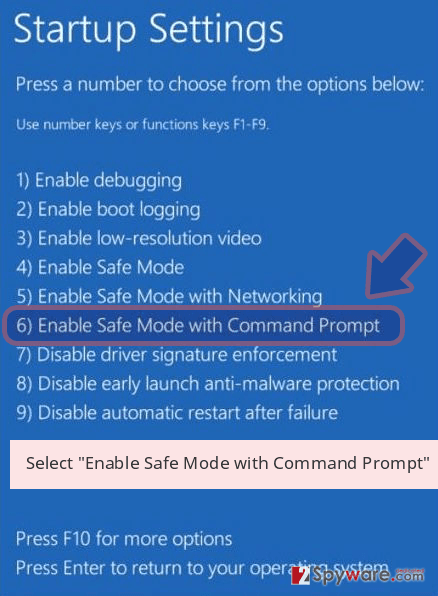 These Windows Registry modifications allow launching the virus as soon as the computer is turned on. The main purpose of the ransomware is to encrypt various documents and media files. In order to do that, the virus might shut down particular system process. Then, it starts scanning the device looking for the MS Office, Open Office, Libre Office, various image, audio and other widely used files. To all encoded files it appends .zorro file extension. This extension prevents victims from accessing and using their files. Unfortunately, even Zorro removal won’t help to restore encrypted data. Of course, hackers do not leave victims without a way out. After data encryption, Zorro ransomware virus creates a text file and places it on the desktop. Indeed, it’s a ransom note that might be called either “Take_Seriously (Your saving grace).txt” or “(Your saving grace).txt.” This file informs people that their files have been encrypted with a strong key and they need a specific key to restore them. The authors of the virus demand 1 Bitcoin that must be transferred to the provided address within 3 days. According to the ransom note, as soon as the payment is made, victims are supposed to receive an email with decryption software. Though, you should not rush clicking on the provided link where you can buy Bitcoins. No one can assure that developers of the Zorro virus have necessary decryption software. Sometimes ransomware viruses are written poorly, and there’s no way to restore the files unless victims have data backups. What is more, cyber criminals might just be interested in taking your money and do not care about keeping their promise. It might be a lie. Thus, instead of having risky business with hackers, you should remove Zorro from the computer. This won’t help to restore your files, but after removal, you can try to recover your files using additional methods. Thus, install Reimage and scroll down to the end of this article to learn more about virus removal. 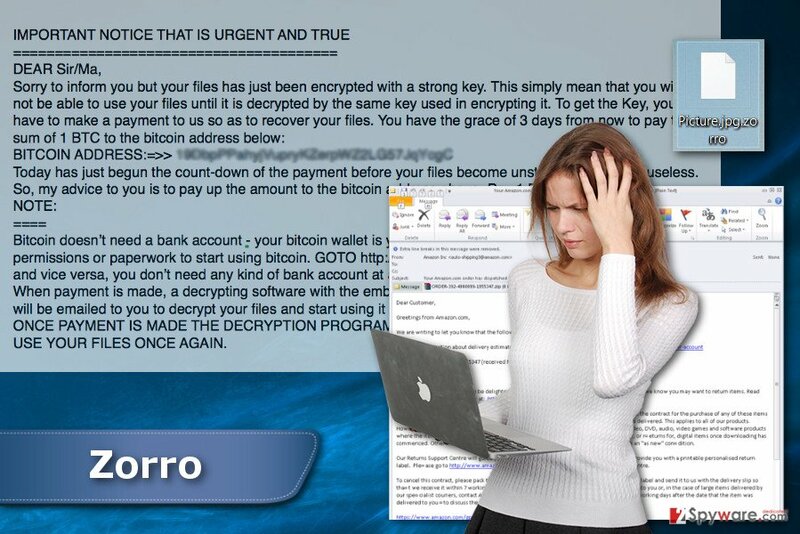 Zorro ransomware encrypts files and demand to pay 1 Bitcoin within 3 days. The primary distribution method of the Zorro malware is malicious spam email campaigns. Crooks send crafted emails that look like sent from reputable companies or organizations, for instance, Amazone. They also have attached PDF, Word or ZIP file that includes malware executable. Thus, as soon as a person opens the infected file, the malicious file is dropped on the system. For this reason, you should learn how to identify potentially dangerous emails and stop rushing to open each received email. Sadly, your inbox is no longer safe as it used to be. Cyber criminals became good at social engineering and learned to trick people easily. Additionally, Zorro ransomware might spread as bogus programs or their updates in peer-to-peer networks, torrents, file-sharing and downloading websites, and similar unknown online sources that offer to download freeware or shareware. Thus, if you are thinking of downloading illegal programs or other files, this decision might cause you more than a license for the necessary product. What is more, if you need to download free software, please choose reliable sources. Ransomware removal might be difficult because these type of cyber infections might block various system processes and antivirus program. 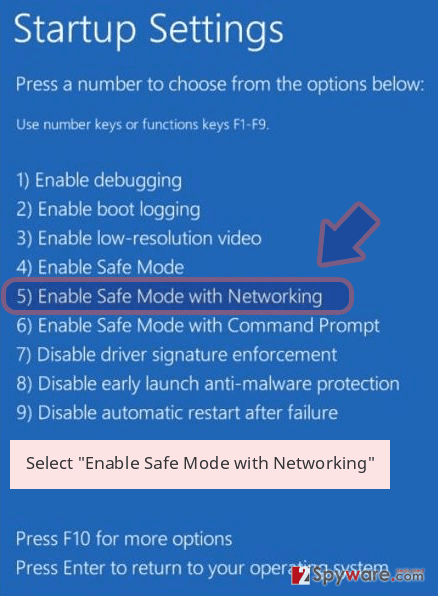 Thus, in order to remove Zorro from the PC, you need to disable the virus by rebooting the computer to the Safe Mode. The instructions below will show you how to do it. When in Safe Mode, you need to install malware removal program, such as Reimage, Malwarebytes MalwarebytesCombo Cleaner or Plumbytes Anti-MalwareMalwarebytes Malwarebytes. After installation, update your chosen tool and run a full system scan. We highly recommend scanning the system several times just to be sure that all malicious components are terminated from the system entirely. Please, do not think about manual Zorro removal option. Deleting dangerous files from the system might lead to the serious computer-related programs. The virus might be hiding under safe-looking and legitimate system files. Thus, you might make a huge mistake and delete the wrong file. 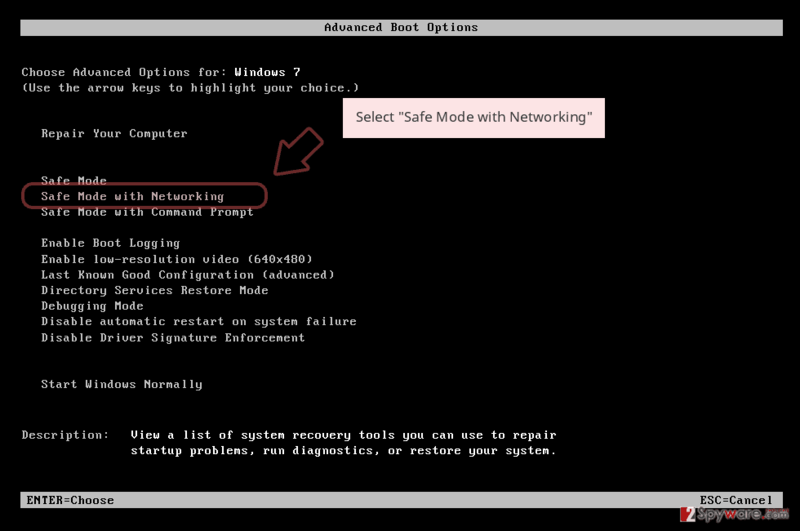 Automatic Zorro removal might require rebooting the computer to the Safe Mode with Networking. This mode disables the virus and allows scanning the system with antivirus or anti-malware tools. Log in to your infected account and start the browser. Download Reimage or other legitimate anti-spyware program. Update it before a full system scan and remove malicious files that belong to your ransomware and complete Zorro removal. 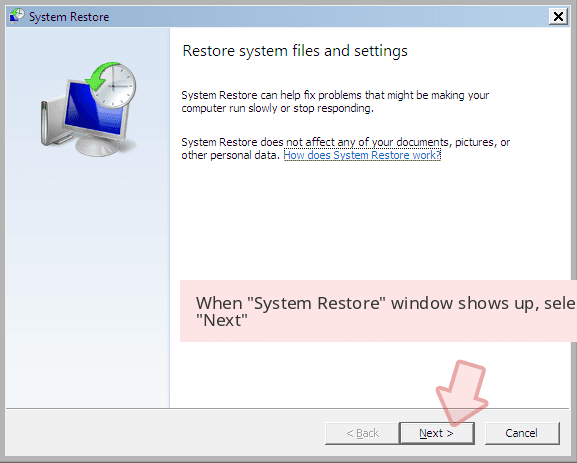 System Restore method also helps to disable the virus and remove it automatically with a help of malware removal tools. 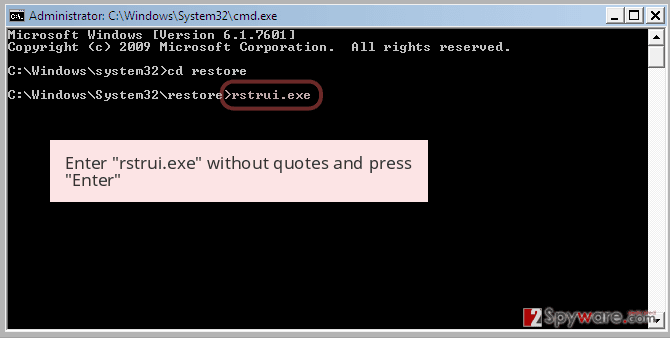 When a new window shows up, click Next and select your restore point that is prior the infiltration of Zorro. After doing that, click Next. Once you restore your system to a previous date, download and scan your computer with Reimage and make sure that Zorro removal is performed successfully. Guide which is presented above is supposed to help you remove Zorro from your computer. To recover your encrypted files, we recommend using a detailed guide prepared by 2-spyware.com security experts. If you do not have data backups, Data Recovery Pro might be your only option to restore your files automatically. Though we have to warn you that it’s not a Zorro decryptor, so it might not restore all of the encrypted files. 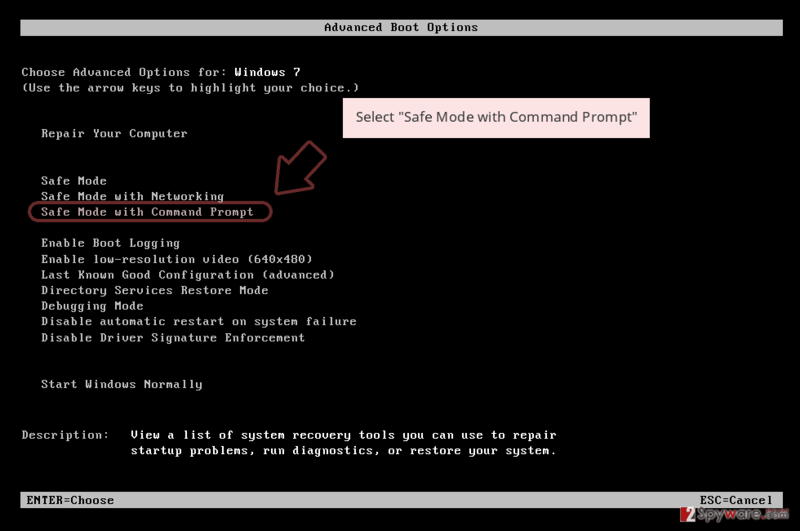 If System Restore has been enabled before ransomware attack, follow these steps to copy previously saved versions of the encrypted files. 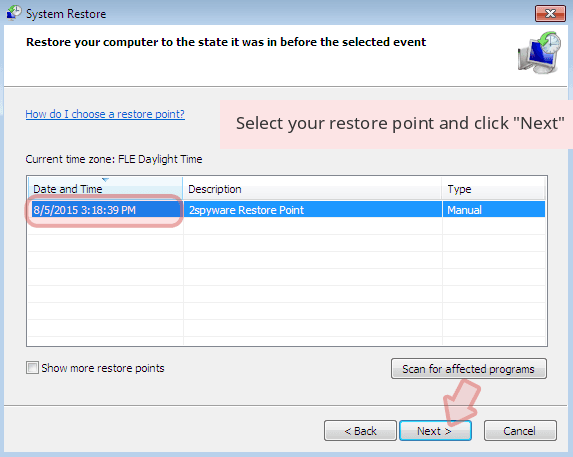 Though, if you haven’t enabled System Restore function, this method is not suitable for you. We are sorry, but Zorro decryptor hasn’t been released yet. ^ Vangie Beal. Symmetric-key cryptography. Webopedia. Online Tech Dictionary for IT Professionals. 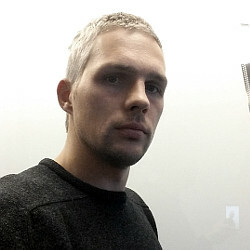 ^ Adam Rice, James Ringold. Command-and-control servers: The puppet masters that govern malware. TechTarget. Includes tips, webcasts, and other advice in a variety of focused enterprise technology channels. ^ Steve Strauss. Ransomware Advice: Pros and cons of paying the ransom. FightRansomware. The website on how to beat the ransomware. ^ How to Identify a Malicious Email: 6 Tips. CGS Blog. Blog offers a wide range or thought leadership content in the application, learning and outsourcing industrie. ^ What is Social Engineering?. Webroot. Next-Gen Cybersecurity & Threat Intelligence. This entry was posted on 2017-03-24 at 02:19 and is filed under Ransomware, Viruses. You can quickly scan the QR code with your mobile device and have Zorro ransomware virus manual removal instructions right in your pocket. How did you remove Zorro virus?